David Reece, Huber’s Thermoplastics Technology Manager, begins his engaging and informative discussion on the effectiveness of Kemgard® smoke suppressants in rigid and flexible PVC applications. We consider it quite an honor and privilege when selected to speak and present a technical paper and information about our product offerings and technology at events such as trade shows and conferences. 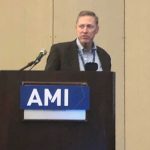 Such was the case this week in Pittsburgh, Pennsylvania (U.S.), as David Reece, Huber’s Thermoplastics Technology Manager, was selected to present to more than 150 attendees at Applied Market Information’s (AMI) PVC Formulation Conference. The annual two-day program held at The Westin Conference Center featured technical presentations from experts​ covering global trends in PVC technology, including the latest advances in a range of PVC additives like functional extenders and fillers. David’s engaging and informative talk focused on our exclusive line of Kemgard® molybdate smoke suppressants, which are cost-effective and manufactured by patented processes in which molybdates are precipitated on an inert core. This “coated core” approach makes more efficient use of the molybdate species by maximizing the active surface area at a much lower cost than pure molybdate chemicals, such as ammonium octamolybdate (AOM). David reviewed new and interesting data about the effectiveness of our Kemgard products in the most demanding rigid and flexible PVC applications. We invite you to learn more by clicking here to download our latest literature which features the data he presented. Also, contact us or visit our Product Finder and request your Kemgard sample today. We look forward to hearing from you.